Probably the most significant change has been more research available and a more scientific approach to the practice of sports medicine over the last 40 years. Innovations in scientific as well as clinical research have helped physicians treat athletes of all types with greater success, and have led to more effective treatment of the NFL player in particular. An NFL player coming out of college through the NFL Combine as a rookie is generally healthier now than his counterpart would have been in the past. We can attribute this to the fact that team physicians are able to better manage the health of players in high school and college as more physicians are trained in sports medicine. 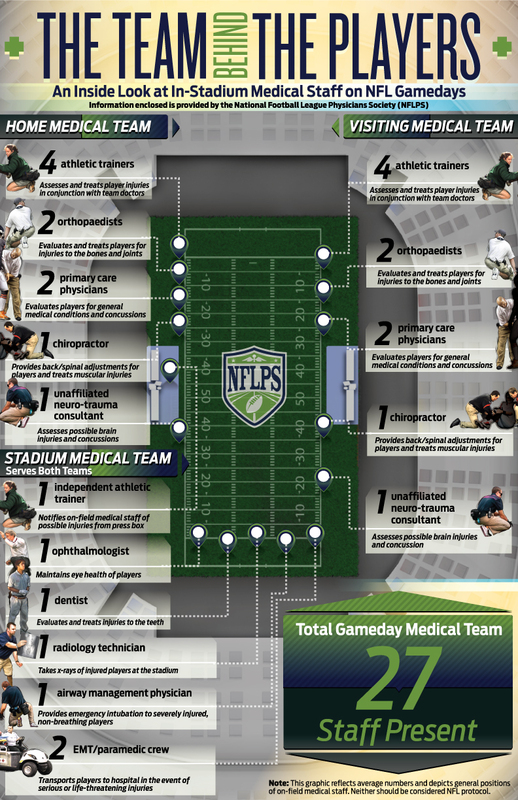 Team doctors utilize scientific and clinical research and receive continuing education to improve every aspect of our medical management of our patients – the NFL players. Among the most important advancements since 1966 have been the ability to take a much more scientific approach to the evaluation and treatment of concussions; the utilization of MRIs to help in accurate and immediate diagnosis of injuries; and, improvements in surgical and physical therapy techniques before and after surgery which helps us manage injuries once they occur and allows players to get back to play at their highest level of potential. 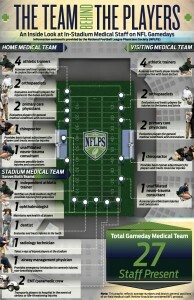 Today, there are over 27 medical personnel on the field during an NFL game.